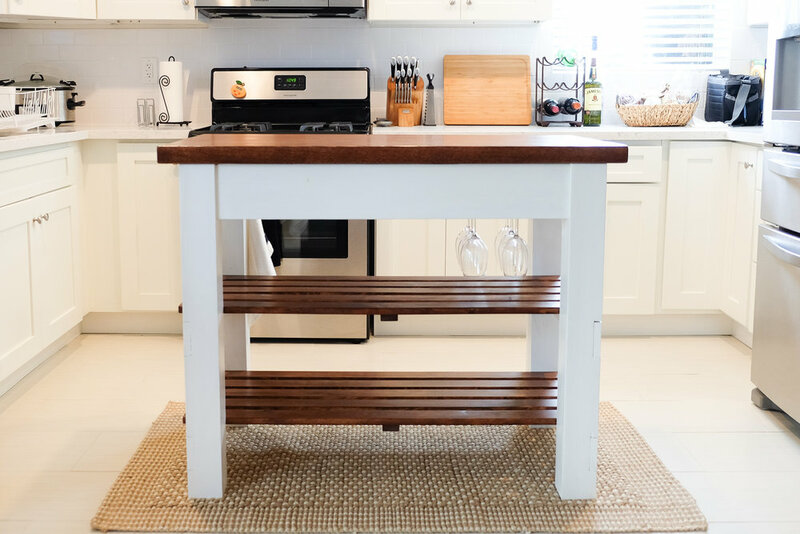 In my search for the perfect kitchen island, I found many I liked that were either way too big, too small, or too expensive. I felt like Goldilocks trying to find the perfect kitchen island for our house. I gave up after a few weeks of searching, so I decided to build my own. I had never built anything this big so it was a bit daunting to think about it. I found some plans from Ana White which I followed and modified to fit our space. Once I saw how things were broken down, it wasn't so bad at all! I also added a bottle opener and a wine rack underneath. I followed the plans pretty closely for the base but modified the dimensions to our specific kitchen space. To create the grooves for the side pieces to fit flush with the legs, I used a circular saw and set the blade depth to 0.75". I cut little slits and then used a chisel set to break off the little "fins" and cleaned it up further with the chisel. I also used a Kreg Jig to attach the stretchers. If you don't have a Kreg Jig, you can use regular screws but then they would be visible from the outside. The base was painted with white latex paint. The slats for the shelves were stained with a Minwax English Chestnut stain. For the island top, I decided to go with a hardwood, white oak, also stained with Minwax English Chestnut stain. Everything was sealed with Minwax Wipe-On Polyurethane which is water based. This is important for the white base legs because it won't leave a yellow tint. So be sure to use a water based finish.